We are excited to announce that MAE AND THE MOON by Jami Gigot has been chosen for the 2018 Reading Lights! Reading Lights, a Vancouver Public Library and CWILL BC partnership project, celebrates the work of B.C. children’s book authors and illustrators and offers unexpected encounters with an array of stories for children and their families near parks, playgrounds, schools and libraries throughout Vancouver. Intended to spark an interest in stories and reading, the program features excerpts of books and illustrations on lamp posts across the city for all to enjoy. To read more about the Reading Lights program and the other finalists, click here. We are excited to share with you the cover of Seb and the Sun by Jami Gigot. Seb is determined to find some light for his sleepy coastal town. It is so far north, the sun does not shine in winter and the days are cold, dreary, and dark as night. So Seb embarks on a mission to find the sun. Along with his friend Walrus, he makes a plan, collects supplies, and rows far out to sea. Will Seb be able to find the sun and bring its light and warmth back to his town? 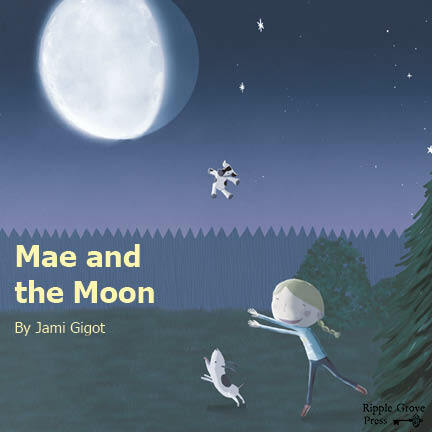 Jami Gigot is the author/illustrator of the picture book Mae and the Moon, and has worked as a digital artist on several motion pictures. In addition to writing and drawing, she enjoys combing the shoreline for treasures with her family. Originally from Madison, Wisconsin, she now lives in Vancouver, BC. Happy July 4th from Ripple Grove Press. Have a safe and wonder-filled day. Today we're working on Seb and the Sun, by the talented Jami Gigot (Mae and the Moon, 2015). Here's a little teaser of Seb and his friend Walrus sharing a honey sandwich with the crust cut off! Happy One Year Anniversary to Mae and the Moon! Mae and the moon love to play together. Their favorite game is hide and seek. But when the moon disappears one evening and cannot be found, Mae wonders what happened and begins to worry. Determined to find her glowing friend, Mae takes matters into her own hands and sets off on a wonderful and curious voyage through her imagination. Where do we start with the praise for Mae and the Moon? This charming book written and illustrated by Jami Gigot has received glowing reviews and been featured on the hit TV show Portlandia. Find this beautiful bedtime story at your local bookstore or library. Check out our website for reviews and an in-depth interview with Jami. Jami Gigot, author/illustrator of Mae and the Moon and the forthcoming Seb and the Sun (2018), recently had a guest column on the Writer's Digest blog. Check it out here to read about the creative process of making picture books.